Manchurian style gravies using cauliflower, chicken and paneer are very popular and taste great with naan, fried rice and noodles. 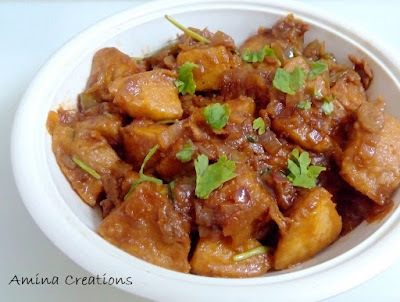 Today’s recipe is a Manchurian recipe with a twist! It is Idli Manchurian that can be served as a main dish. This is an ideal dinner dish but you can also make this for breakfast if you are bored with eating idli sambar and wish for a change from your regular menu. Take the idlis and cut each into 8 or 10 pieces. Take all the ingredients of the batter in a bowl and mix well. Add water to form a thick batter. Heat oil in a pan and keep ready. Dip the idli cubes in batter, coat well and deep fry in oil till golden brown in colour. Transfer the fried idlis to a plate and keep ready. Now to prepare the sauce, heat oil in a pan, add garlic and ginger and saute for a couple of minutes. Add tomato ketchup, soya sauce, vinegar, chilli powder, salt and pepper powder and mix well. Finally add the fried idlis and mix well.